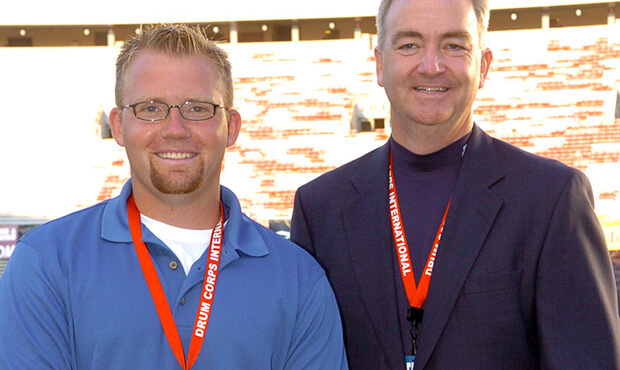 David Glasgow (L) with DCI Exec. Director Dan Acheson at the DCI World Championship Finals in Madison. Every year the directors of each division vote to name one of their peers Director of the Year. In Division I this award is known as the Dr. Baggs Leadership Award, named for DCI Hall of Fame member Dr. Bernard Baggs. Determined and voted on by all of the Division I directors, this distinction carries with it a high degree of honor and respect. This year, the Dr. Baggs Leadership Award has been awarded to David Glasgow, executive director of the Bluecoats. Glasgow is the first full-time director in Bluecoats' history, and was Bluecoats' drum major in 2000 and 2001. The experience on top of the podium helped lead him to the post of corps director. "When I was drum major, I enjoyed that position, and I felt that I wanted to develop leadership within the corps a little more," Glasgow said. "When I was offered the opportunity to work for the corps I thought I'd just try it and see if I liked it. Mostly I was in the right place at the right time." Being a full-time director has allowed Glasgow to concentrate on providing the best experience for the Bluecoats' members. "I can devote all of my time to trying to develop the organization, so the quality of what gets done gets better. And that carries over to a better experience for the members on the field," he said. "Our number one focus has been that we provide the members the tools they need to be successful. That includes everything – great transportation, great housing, a great show, great instruments. The competitive success has come from that, making sure the members and the staff have the tools they need to be successful." Glasgow is the youngest director of a Division I corps, and his relative youth can sometimes make his job more difficult. "Just being 26 and having to work with people who are twice my age can be a challenge," he said. "To gain their respect and trust takes time and effort." But, he said, experiencing the evolution of the corps over the course of the summer makes the work worthwhile. "I think watching the members develop over the course of the a season is a really exciting thing – to see them go from people who don't know what this drum corps thing is, to just awesome performers, is really fun," he said. "We've got some exciting things planned already for 2007, so everybody should stay tuned!"